The meaning of this verse is explained for children so well over at Seeds Family Worship (which is also where the video comes from this week.) They have a short explanation for each day of the week as well as activities you can do. Even if you only take one or two of these ideas I think it will enhance the memorization of the verse. Plus it looks like fun, quality time! 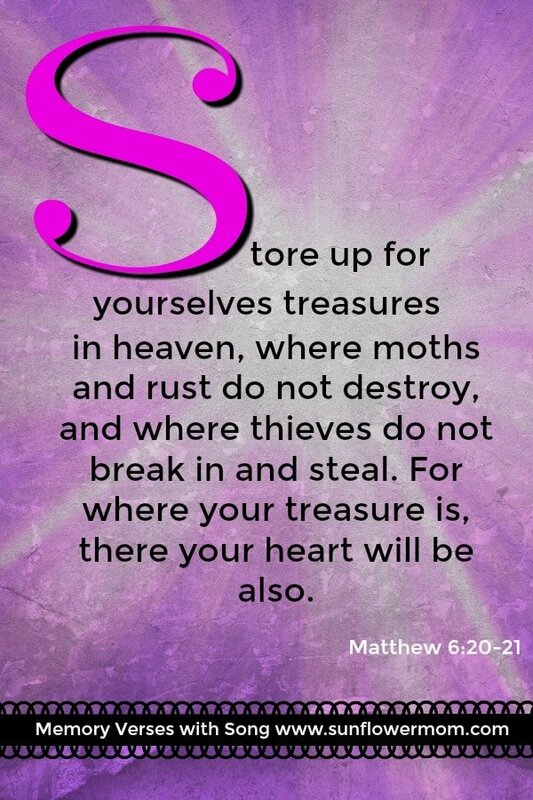 Visit the resource library to print out Matthew 6:20-21. Hang it nearby where you memorize your verse each day. The video to aid your kids in learning Matthew 6:20-21 is from Seeds Family Worship. I’ve mentioned their music before. They have great tunes that help kids (and adults by default) easily learn scripture from the catchy tunes. I think your kids will like this video because it comes with hand motions. My children always enjoyed getting up and dancing when learning the bible verses. We have been learning one Bible Verse for each letter of the alphabet. For each letter, there is a printable of the verse and a song to make it fun and easier to memorize! I used this exact method with my children and five years later they still remember all 26 verses! Find the full index of ABC verses over here. Looking for an Adult Study? Join here for a 6-week series that includes a Prayer Journal, a new Phone Screensaver each week, and weekly worship videos to enhance your prayer time.